Member and Affiliate organizations from across the country send Corpsmembers to Florida, South Carolina and North Carolina. Corpsmembers will participate in a range of clean-up, assessment, and volunteer-management activities. WASHINGTON, DC (October 25, 2018) In response to Hurricanes Florence and Michael, several organizations from The Corps Network’s membership are in the process of collectively deploying over 100 AmeriCorps members to Florida, North Carolina and South Carolina as part of the AmeriCorps Disaster Response Team (A-DRT) program. 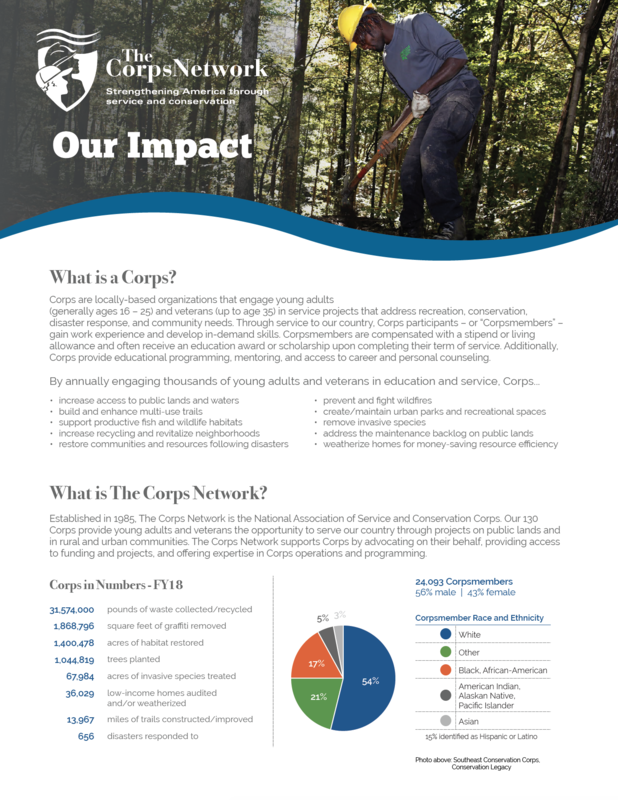 These organizations include American YouthWorks – Texas Conservation Corps; Arizona Conservation Corps; California Conservation Corps; Conservation Corps Minnesota & Iowa; Montana Conservation Corps; the AmeriCorps National Civilian Community Corps (NCCC); SBP (an Affiliate member of The Corps Network); Southeast Conservation Corps; Utah Conservation Corps; and Washington Conservation Corps. In addition to members from A-DRT programs, Corpsmembers from Conservation Corps of the Forgotten Coast and Children’s Home Society of Florida are assisting recovery efforts in their home communities in Florida. CLIMB Conservation Corps (based in Mississippi) is also assisting in Florida. Over the coming weeks, young adult Corpsmembers from the above-mentioned programs will engage in a range of response and recovery activities, including: organizing volunteers; distributing donated supplies; removing downed and hazardous trees; collecting debris; mucking and gutting water-damaged structures; installing temporary tarp roofs; conducting disaster assessments; and helping storm victims access supplies and various support services. Going forward, future crews may be deployed to assist in rebuilding, revegetation, and resiliency projects. In North Carolina, Utah Conservation Corps deployed staff the week of October 15 to establish operations. They are welcoming Corpsmembers the week of October 22. In South Carolina, Washington Conservation Corps deployed two crews on October 13 to establish operations. They began accepting Corpsmembers last week from Arizona Conservation Corps, Conservation Corps Minnesota & Iowa, Montana Conservation Corps, and Southeast Conservation Corps. In Florida, Washington Conservation Corps sent staff the week of October 15 to establish operations. Other programs currently serving in Florida include California Conservation Corps, SBP, Conservation Corps of the Forgotten Coast, the Children’s Home Society, CLIMB Conservation Corps, and American YouthWorks. A-DRT deployments are managed by the Disaster Services Unit of the Corporation for National and Community Service (CNCS). AmeriCorps NCCC and AmeriCorps grantees make up the A-DRT program. A-DRTs engage in activities and trainings year-round and are a nationally deployable resource. Nearly all of the 18 AmeriCorps programs that comprise the A-DRT program are members of The Corps Network. While Corpsmembers in these programs generally spend the majority of their service term engaged in conservation-related projects, they are ready to deploy to natural and man-made disasters within days of an incident. A-DRT crews serve alongside local, state and federal disaster emergency management agencies. Conservation Corps of the Forgotten Coast, Children’s Home Society, and CLIMB Conservation Corps are part of a National Academy of Science grant program led by Conservation Corps of the Forgotten Coast (CCFC). The objective of the program is to establish a Gulf Coast disaster response team that engages local Corpsmembers that can support each other when a large-scale disaster occurs in the region. Hurricane Michael put this model to the test. Based in Apalachicola, FL, CCFC was hit hard by Michael, however, two Corps – Children’s Home Society and CLIMB Conservation Corps – were able to respond to CCFC’s needs within four days of Michael’s landfall. Hurricane Florence made landfall as a Category 1 storm on September 14 in North Carolina, causing massive flooding. Hurricane Michael made landfall as a Category 4 storm on October 10 in the Florida panhandle, causing catastrophic wind and water damage. To date, more than 500 AmeriCorps members have responded to both Hurricanes, with roughly 175 currently assisting in Florida.